For the purpose of comparison to other food storage supplies, this Vegan 1 month Food Supply provides one adult with 2,037 calories per day for 30 days. Vegetarian Food Supply for 1 month is for vegetarian individuals or families wanting a supply of emergency food storage for one person or a 2 week supply for two people. It provides the versatility of cooking your own meals by including baking and cooking staples. 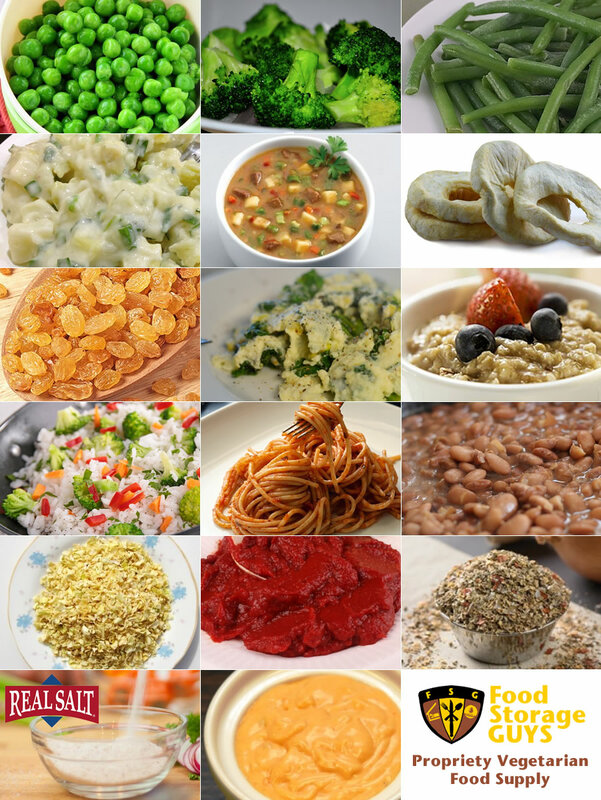 Our supply contains dried, dehydrated, and freeze dried foods under the following categories: fruits, vegetables, pasta, beans, rolled grains, and more! See the full list of products below. 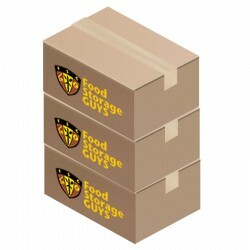 This supply provides 9 servings and 2,037 calories per day. It is intended to provided a healthy balanced diet with a variety of vegetables, fruits, beans, and grains. *FREE SHIPPING applies to the Continental United States only. Please call 888-550-4480 when ordering for Hawaii, Alaska and International destinations. What is a #10 can? This is a large steel can that is 6.25 inches in diameter and 7 inches in height. The can will hold about 3 quarts (12 cups; 3/4 of a gallon; 2.8 liters). The cans are enameled to extend the shelf-life and protect the food. Cans contain an oxygen absorber to remove the oxygen which will deteriorate the food over time if not removed. This packet should discarded and not be eaten. It will not continue to absorb oxygen after you open the can the first time. Each can comes with a plastic lid for sealing the can after you use a can opener to remove the metal top. The freeze dried vegetables can be prepared by placing food in a small pot with a little over twice the amount of water as food. Example: 1/2 cup of freeze dried broccoli and 1.1 cups of water. Heat the pot until it comes to a boil and remove from heat. Let cool for about 10-15 min. before serving. Freeze dried fruits can be eaten dry or added to cereal before or after cooking. Dried vegetables like the potato dices and vegetable stew blend will need to be soaked in water for 10 min., then brought to a boil. Boil in 4 times the amount of was to food. Example: 1/2 cup of dried stew to 2 cups of water. Simmer covered for about 10 min. or until tender. Dried fruits can be eaten dry or added to cereal before or after cooking. Dry beans will need to be cooked before eating. To save on cooking fuel, we recommend soaking your beans over night in water. This causes beans to release enzymes that begin to break down their complex carbohydrates into simple sugars allowing faster cooking, better digestion, and less flatulent production. After soaking beans, drain and rinse several times. Place beans in pot and add enough water to cover the beans by about an inch of water over them. Bring water to a boil and reduce heat and simmer for about 90 min. Test for softness. Simmer for another 30 min. testing every 10 min. until soft. What is the difference between freeze dried and dried? Freeze dried food has 98% of its water removed. Dried food has 95% of its water removed for vegetables and 80% for fruits. Freeze dried foods retain their original size, shape, color, taste, and texture. Dried foods are shriveled in size as the moisture is removed so they take up less space. Freeze dried foods rehydrate faster than dried foods do.